Even if your local area hosts some great events, it’s likely that you’ll eventually need to trailer your boat and travel to a regatta. Once you get there, follow Travis Odenbach’s six steps to make sure your boat launch is successful. Over the years, I have traveled and trailered boats to countless one design regattas. The three events of the 2018 Quantum J/70 Winter Series at Davis Island Yacht Club in Florida were added to that list this year and prompted me to share my process. I have fined tuned my boat launch process to make sure things go as smoothly as possible in order to get us to the fun part: sailing. When arriving to a regatta, here are the steps I like to take before the boat is ready to be splashed. For any boat I am sailing on, I like to start by taking everything out of the boat and going through the inside of the hull to make sure it is dry and cleaned out. This is pretty crucial in my mind, as it allows me to put back only the things that are needed for racing. The boat is a great place to store tools, gear, and transport anything your team needs, saving on airline luggage fees or giving your teammate that extra seat to stretch out on if driving. Once everything is out of the boat, give it a good wash. I recommend keeping it simple; wash first with Dawn dish soap to cut any oil and grease residue from the road, and then follow using your favorite boat wash. However, pay attention to the runoff from your boat wash. It’s not uncommon for the runoff to go into the body of water at the marina, even if unintentional. If this is the case, use non-toxic and biodegradable products. If you need help finding a good product, Sailors for the Sea put together a great list here and also offer recipes for making your own cleaners. Washing your boat is the perfect time to inspect the hull for any damage sustained during the trip. Make a list of any needed repairs and make them a priority as soon as the boat is dry. 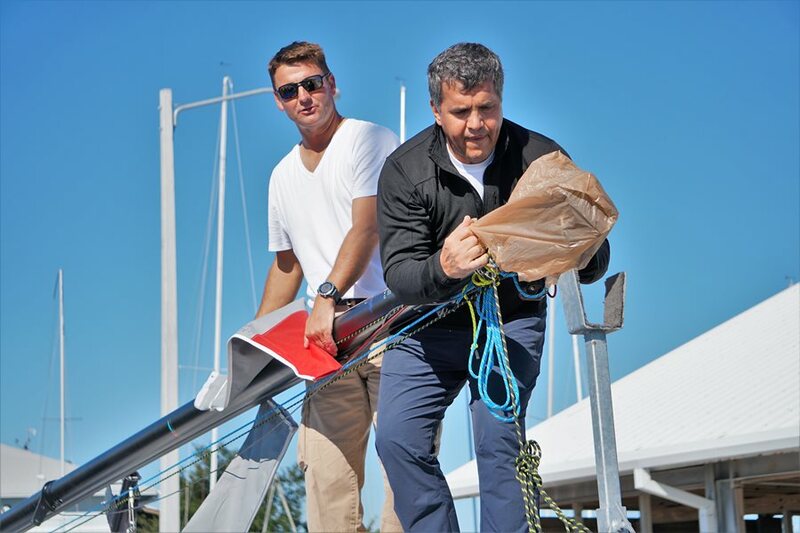 Rigging the mast is one of the most important parts of the regatta prep; you can benefit greatly from a few minutes of preventative care. Start by cleaning off the mast and checking all the fittings. This is especially important if you race in a lot of salt water, as the fittings can become corroded or just plain unusable. After you have checked the rigging and fittings on the mast, it’s time to put up the mast. Once you get the mast up, it’s time to repack the boat and put things back into the cockpit. Be very picky about what you put back on the boat. Only pack the things you will need for racing! Now that the boat is clean and organized, we move on to the fun part of tuning the boat. Quantum Sails has a quick tune guide that gives you each number from base to heavy air or base to light air. This guide also lists the number of turns needed to get from base to each setting. Remember, each boat is different, so I advise starting with the quick tune guide and then creating your own guide with your specific numbers. Set the boat at base, grab a crew member, and count the turns that it takes to get to each setting. Write these down in a quick tune template or in your wet notes (click here for the J/70 guide). This makes tuning on the water very simple. After that is finished, check the side-to-side measurement of the mast. I use a bucket filled with water and tie this onto the main halyard or the spin halyard. I take a tape measure and measure from a fixed point on the bow to the widest part of the boat. Now make a mark on the halyard and line it up with the line on the hull or sheer that you have made. You can adjust your uppers to get the halyard to line up on either side of the sheer. Note: Remember to enlist your sailmaker if you have any questions or are struggling with tuning. If there are any Quantum teams at the event, they’ll be happy to help. The last step is hoisting and splashing. This is pretty straightforward, but there are a few things to note. Since the boat was on the road, it’s important to check the keel and rudder once the boat is up in the hoist to make sure there are no surprises. I keep a box of sandpaper handy, just in case I find any scratches or rough spots. It’s best to have at least one other crew member with you for this step; not only is an extra set of eyes helpful when checking the boat over, but you also want to be efficient and not monopolize the lift and hold up the line. All this prep is tedious work, but it is well worth the effort in order to avoid surprises on the water. Use this process as a starting point and fine-tune it to meet your team’s needs. Review these steps with your team and then make your own checklist and assign roles to make sure nothing gets overlooked. Click here to get George Szabo’s trailering checklist to ensure your boat makes it to the regatta safely.